Back in June, I got the chance to head out to Los Angeles to attend the Electronic Entertainment Expo (E3), an industry convention where video game developers, media, and vendors alike all converge on the downtown convention center for three days, showcasing upcoming releases, new technologies, and giving away some free swag. My brother Kevin currently lives in the southern California area and was going to be attending the convention with me, so I flew out a few days early to get the chance and hang out with him. We met up the morning after I arrived into the area and were hungry enough to head out and find a place to get some brunch. It worked out great since Kevin said that he knew of a pretty good place a little east of him in Camarillo. When we started driving onto the regional airport grounds, I’d thought he had made a wrong turn. As it turns out, this restaurant was nestled inside the airport, where you could literally step right off a plane and sit down to eat. Kevin mentioned that the place could get pretty busy on the weekends for brunch, and that certainly wasn’t an understatement. We arrived at the place a little before noon and there was already a 45 minute wait. My brother assured me that the food would be worth it, so we decided to tough it out. 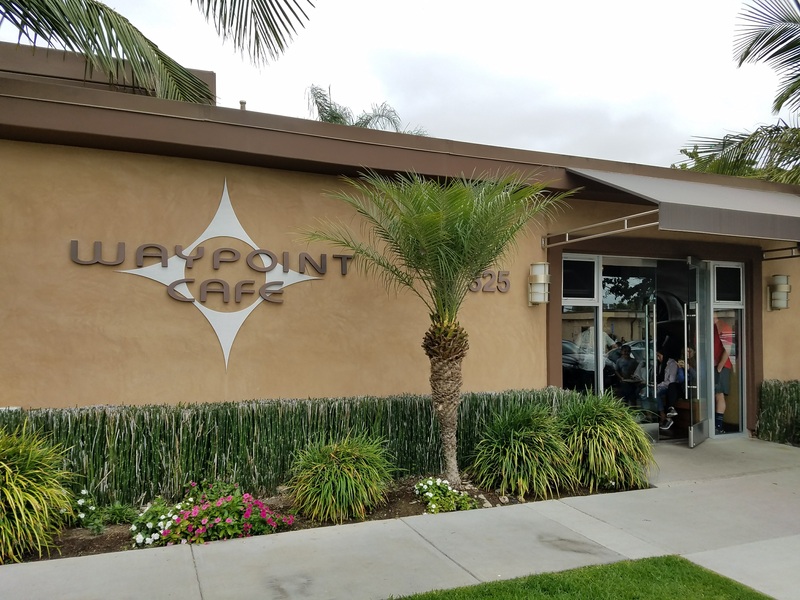 In addition to the front entrance where there were quite a few people already gathered waiting for a table, Kevin took us all the way out to the back of the restaurant, where there was an additional waiting area that actually was adjacent to a flight ramp for the airport. Several single-engine propeller planes were already parked out there, and while we were waiting, we actually saw one of the diners leave through the back gate, get into a plane, and head out. Certainly not a bad alternative to driving to the restaurant! Between chatting, people watching, and just enjoying the general scenery of the area (there were some small mountains that provided a backdrop to the airport grounds), the waiting time flew by relatively quickly and our name was called up to get seated. We ended up at the outdoor patio seating in the back, not too far from where we had been waiting. The weather was fantastic, partly cloudy with low humidity, so we didn’t mind eating outside. Looking over the menu, I could see how the array of options to choose from made Waypoint Café a solid brunch spot. From omelettes to sandwiches to breakfast platters, there was certainly something for whatever you might be feeling. Kevin mentioned that the place had some pretty good milkshakes; I hadn’t had a shake in quite a while and decided it was time to “treat yo’ self” with a cookies & cream milkshake. 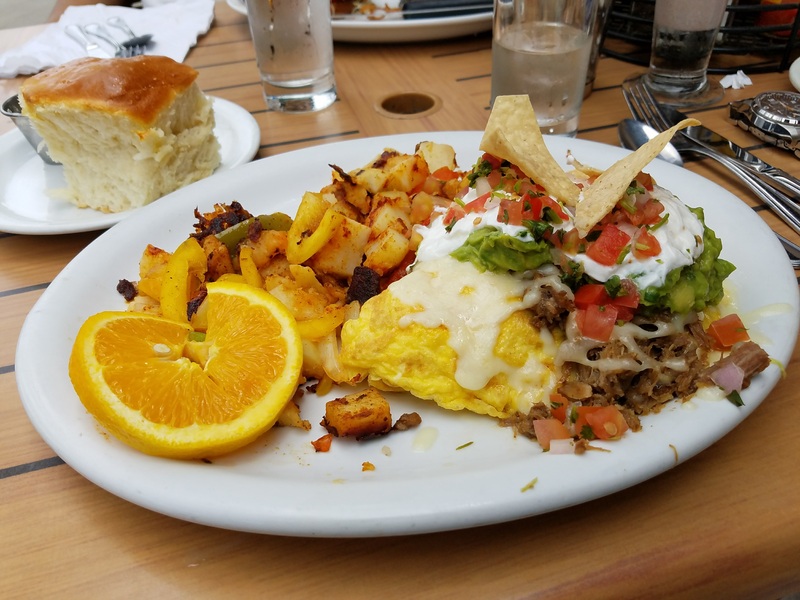 For food, I went with the California Omelette, loaded up with provolone cheese and shredded pork, topped with guacamole, sour cream, and some pico de gallo. It also came with a side of seasoned home fries and a house-baked roll. My brother was feeling more the lunch route and got one of Waypoint’s signature burgers: the Smokehouse BBQ, complete with bacon, crispy onion rings, and smothered in BBQ sauce. The amount of food was certainly an undertaking, even for my standards. The milkshake was really good, just the right consistency and a nice balance of flavor, with little cookie chunks at the bottom, too. I did, however, already feel kind of full after finishing the shake, so when the omelette came with the potatoes and roll, I knew it’d be an uphill battle to finish it all. The flavors of the omelette blended very well together, with each bite containing a hearty amount of guac, sour cream, and pico to compliment the provolone cheese. The home fries were well seasoned, with a nice contrast of crisp and soft pieces. I also enjoyed the peppers and onions that were mixed in as well. I ended up taking about half of the plate home with me for leftovers. Just goes to show that I’m not in my prime eating shape anymore (like when I was tackling that 1.5 lb. burger in the “About Me” photo). 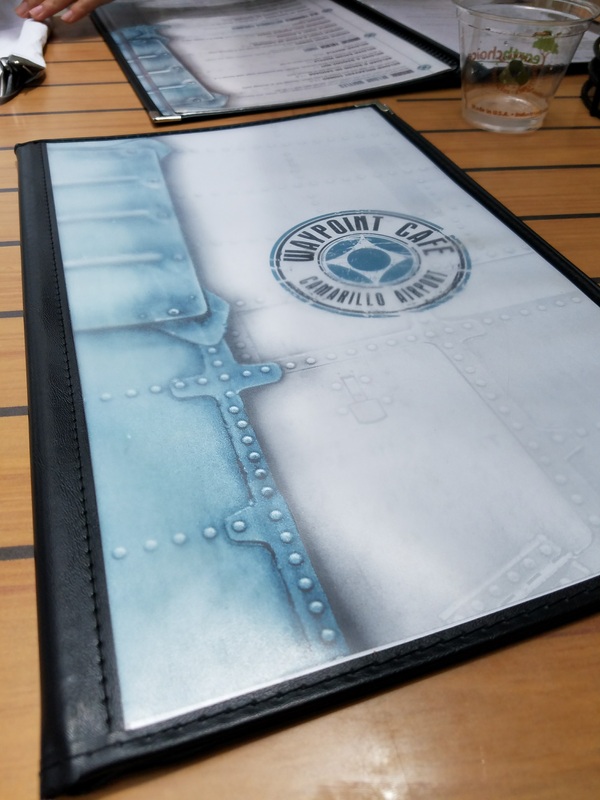 Although Waypoint Café can get pretty crowded due to how popular it is for brunch, the combination of hearty, delicious food with the unique atmosphere of being right in the middle of an active regional airport makes this restaurant a place to experience at least once. Be ready with a good appetite; their portion sizes don’t mess around! I know I’ll be better prepared for the next time I stop by. Let’s now take a look at the Waypoint Cafe Dish Spotlight. Asterisks (*) below mark my recommended dishes. Three-egg omelette loaded with shredded pork and provolone cheese, topped with guacamole, sour cream, and pico de gallo. Served with seasoned home fries. With an eclectic selection of breakfast items to choose from, you’re bound to find something that you’re in the mood for. All the ingredients tasted very fresh as well. As an aviation enthusiast, you really can’t get much better than being right in the middle of an active airport. From periodically witnessing planes taking off & landing to seeing planes start up right on the flight ramp and hearing the engine noises, it was cool to be surrounded by that while you were dining. I do have to say that the service honestly felt a little lackluster. The hostess didn’t greet us as we entered and pretty much herded us to the table, dropping off menus and diningware before jetting off (no pun intended). Our waitress was a little better, checking in on us from time to time to see how things were going. When we were looking to pay the bill, however, she was nowhere to be found, so we had to flag down another waitress to get it taken care of. I thought the food pricing was pretty standard, with a little bit of markup for being on such a premium location. Entrées generally seemed like they were in the $13 – $16 range, with appetizers no greater than $9.